This indoor electric grill from Brentwood is not so big in size but it is efficient like other big ones. Brentwood TS-640 Indoor Electric BBQ Grill has nonstick cooking surface for easy cooking experience. The one-third of cooking area is flat for griddling while the rest two-third is grilling surface with ridges. 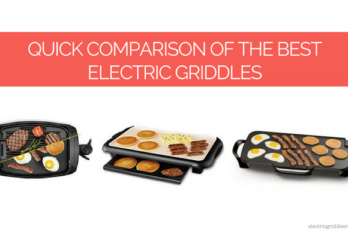 Like most of the electric griddles and grills, this also offers healthy meals that are fat-free or very less greasy. The nonstick surface makes the cooking easy and less greasy as well as easier cleaning. And the cooking plate is removable making the cleaning process easier. The drip tray catches the excess grease while cooking. It can easily be cleaned, as it is removable. But the downside is that it tends to fall off. This Brentwood model features the cool touch handles, which will allow the easy and safe maneuvering of the unit while cooking. The adjustable thermostat control lets you easily control the temperature with a control knob and is removable which is great while cleaning. Also this has Led Light Indicator. Very few users have complained about the uneven heating but that is the case with most of the electric griddles and grills. Like the cleaning, storing this unit is also not a problem. Since it is not one of those bulky ones, you can easily find a place on your kitchen countertop and kitchen cabinet. 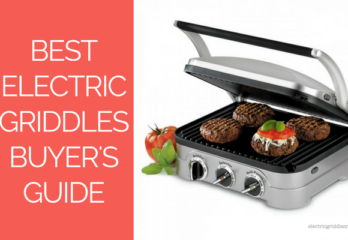 This indoor electric bbq grill does not smoke excessively that makes it great for indoor grilling. Though well ventilation system is recommended in the cooking area. 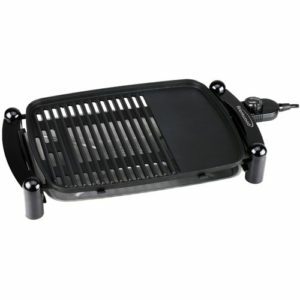 This is a great little grill that leaves perfect grill marks on your foods. This is ideal for couples or an individual. You can check the price of this grill here. 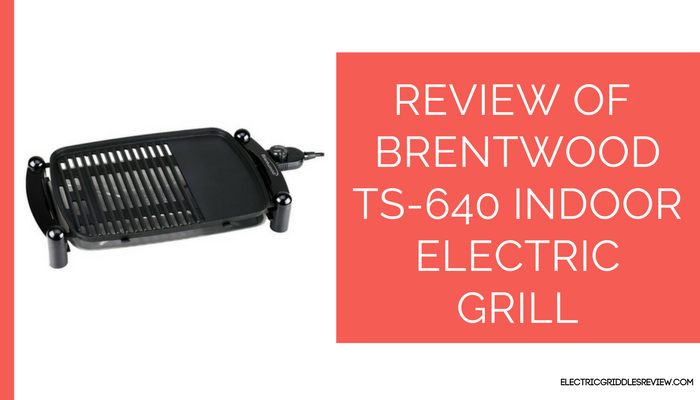 You might want to check the review of Brentwood TS-840 Electric Griddle.